Like all self-respecting mammal watchers I have long wanted to visit Madagascar. But something had held me back. I think this was largely the fact that my Madagascar trip would be the very last time I could travel somewhere and delight in a frenzy of mammal ticking. Madagascar, unlike anywhere else I can think of, would be the last time I could pick up 30+ new species of larger mammal in a couple of weeks. My self control was weakened after Fano (Fanomezantsoa Andrianirina) contacted me in 2009. He had seen mammalwatching.com and wrote offering to accompany me on a trip if I could get myself over there. Fano’s a well known Malagasy nature guide, and he works with some of the best ecotour companies like Rockjumper, Indri and VENT. He is widely regarded as an excellent guide and a very nice guy – both of which I vouch for 100% – and is now starting to arrange private tours too. In late 2010 I finally decided to visit. Go. It is wonderful. Great people. Fabulous mammals. The people are about the friendliest I have met anywhere. 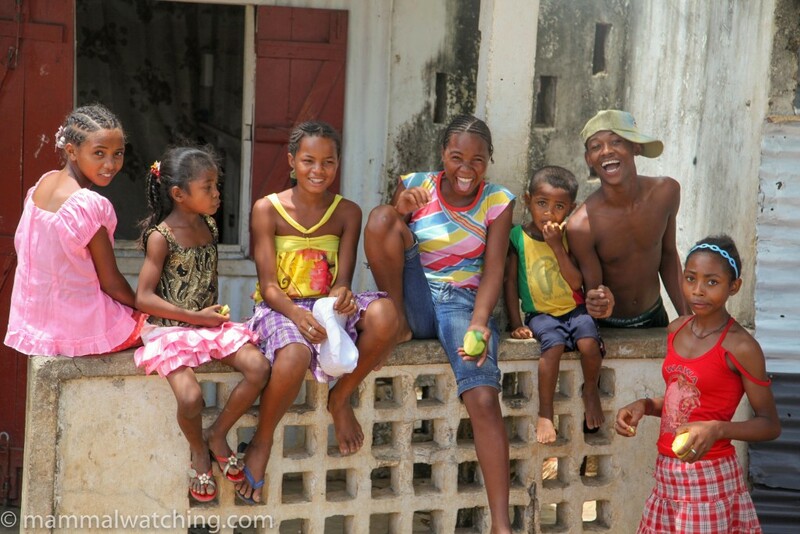 The Malagasy are Africa’s answer to the Thais. It is also pretty safe. When preparing for New Year’s eve in Tana, Fano advised me that Tana at night was safe and the only problem I was likely to face was from being followed around by ‘the ladies’. The wildlife is superb and impressively easy to find, largely because the local guides are so good. I’ve never been anywhere where there are so many hardworking, skilled and knowledgeable guides. What is more they know more than just the usual charismatic species. 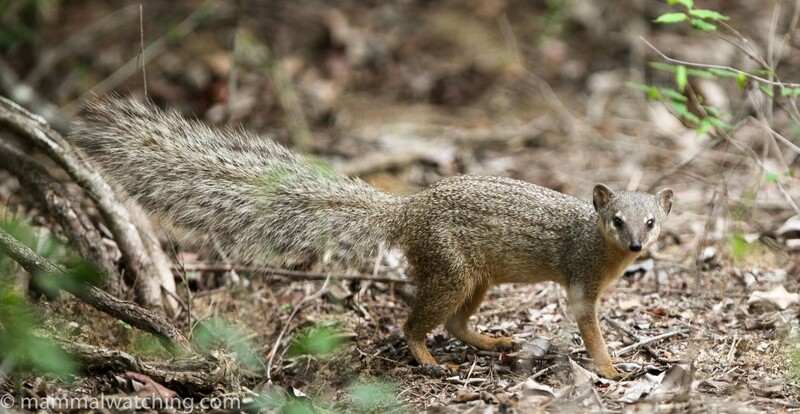 They know where to find mammals large and small and many are good at identifying even rodents. Though the Malagasy see themselves as somehow separate from Africa (just like the Brits refer to Britain and Europe), Madagascar is Africa, so has much of the hardship, adventure and vibrant humanity you might expect. Fano advised, bring a raincoat, a flashlight and a big sense of humour. Though in truth I only needed the flashlight. Nick Garbutt’s Mammals of Madagascar A Complete Guide is excellent and all you need from a guide book. The book also has a very helpful – and in my limited experience – still reliable section on which species to see in which parks. Unfortunately all the national parks are now closed at night. Many of the nocturnal species that Nick mentions are still findable on the borders of the parks, but not all are. Most people favour October or November. It’s probably the optimum time for most species but it is also the busiest. 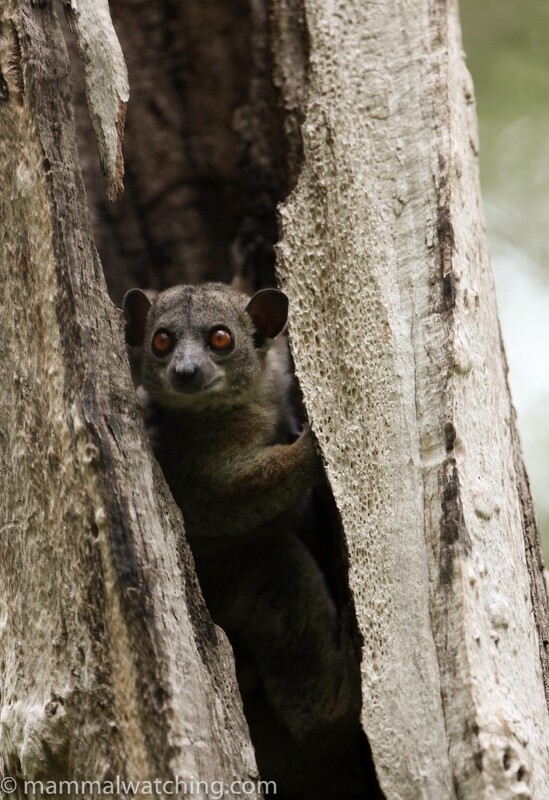 It is hotter in December/January but some species are probably easier to see (though some others are a bit trickier with, for example, the Sportive Lemurs were not using their tree hole roosts and the males of at least one tenrec species in Ankarafantsika was already dormant). Although it is the rainy season it didn’t cause any real problems for our travelling even if we may have been lucky. Rain wasted a morning in Ranomafana but otherwise the only rain fell when we were driving or resting. I would be inclined to visit at any time other than peak season when the crowds of tourists would, I know, irritate me. And whenever you go you can base a pretty good itinerary around the season. For instance, I want to return to try for some of the northern species and would try to do that in the austral winter. We didn’t have a strict itinerary when we arrived. Fano preferred to play things by ear. With luck it is possible to see all the key species in a park far quicker than anywhere else I have ever been. And so the trip ended up looking like this. 9 January – Ambositra to Ranomafana for an hour then back to Tana and home. 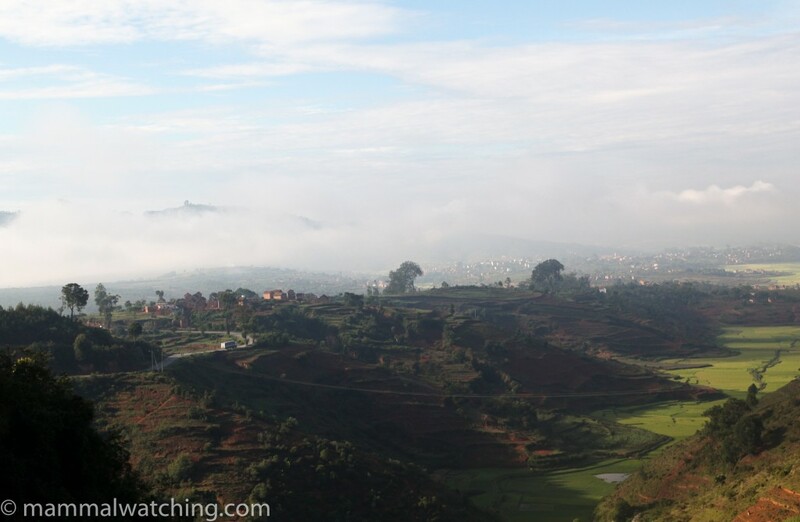 It is about 11 hours on Air France from Paris to Tana (aka Antananarivo). Air France had been kind enough to upgrade my seat to one in premium economy. I am extremely glad I had not spent my own money or air miles on this “bonus”. Premium economy, it seems, gives you a better headset, no choice of food (indeed when I dared asked what mystery lay beneath the tinfoil I might as well have asked for the solution to Fermat’s last theorem), no drinks beyond a wine with lunch and a flight attendant call button that might as well have been a magic lantern the good it did in summoning anything. I think holding a séance was possibly the best way to summon an assistant. Failing that you could always guarantee a sighting by setting one foot through the curtain that guarded the path to the business class toilet. Still we were only an hour late landing and I had used miles to buy the ticket. Fano booked me into the comfortable Rafia Hotel near the airport. I grabbed 4 hours sleep and met him at 7 a.m. to begin the trip to what most people call Ampijoroa, but is now officially called Ankarafantsika, National Park. There are various ways to travel to Ankarafantsika but Fano recommended we travel by the local taxi brousse, one of the cheaper options and probably one that allowed us to get there as quickly as any of the others. We travelled in a convoy of three minibuses (to reduce the risk of being held up by bandits), and our driver had a bright future as a test pilot. But the bus was comfortable, the road was pretty good and we arrived in under 8 hours. The scenery however was depressing. As Steve Anyon-Smith remarked in his report from 1998, the first few hours of the drive are across a sterile plateau, up at about 1400m, that would once have been forest and was now Astroturf. Even the cows didn’t want it. And every tree that could have been chopped down had been, with just a few strands of forest left along the bottom of gullies. 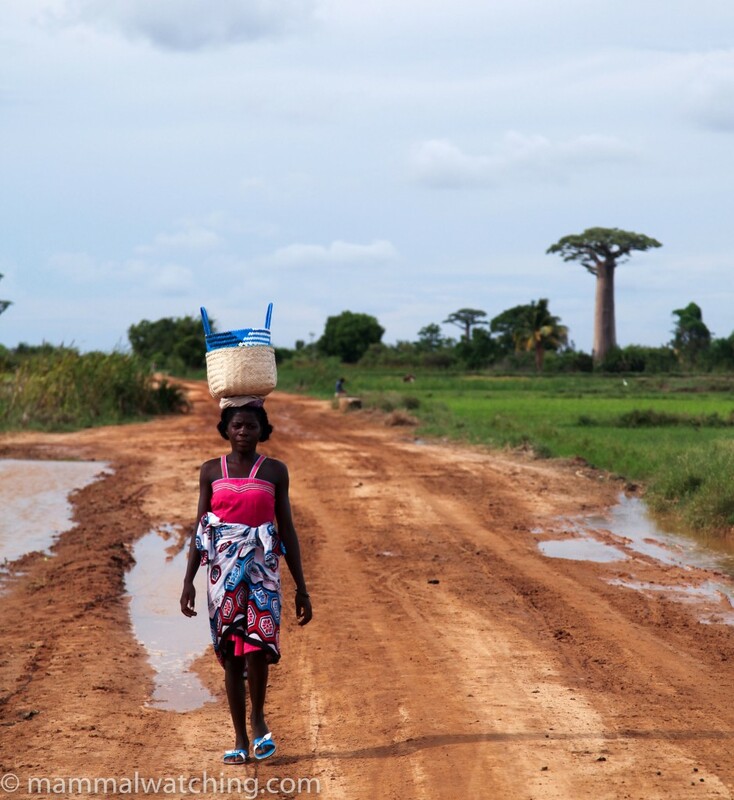 The last few hours are through a lower and more typical African landscape, where it was also much warmer. Fano took my bags to the park bungalow while I met Jacky, the first of our outstanding local guides, who one minute later was showing me 3 beautiful Coquerel’s Sifakas in a mango tree outside the park HQ. Like all Sifakas, these guys will dance when they come down to the ground, but they remained in the trees while I was looking at them. Fifteen minutes later we were across the road and at the lakeshore looking at a troop of Brown Lemurs that were very approachable (both species roost around the park HQ). Jacky then took us for a short walk through the bush to try to find the last diurnal lemur in the park, the Mongoose Lemur, eventually tracking some down back near the headquarters. 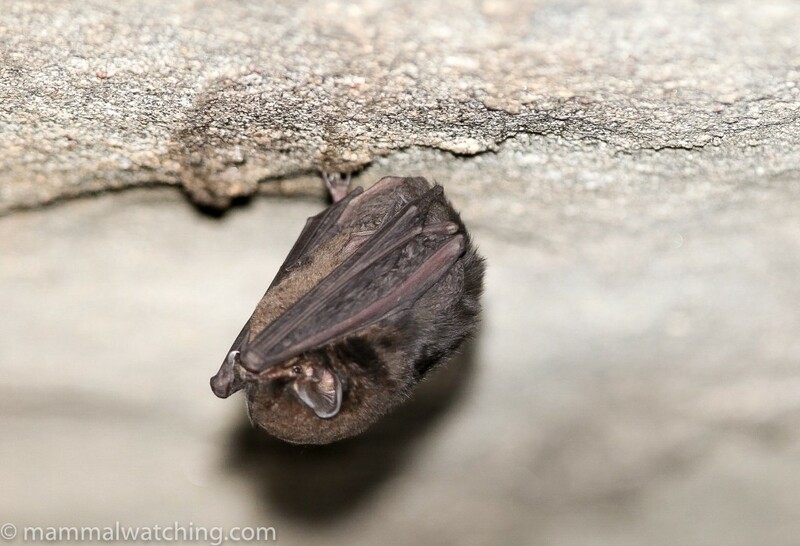 The afternoon ended with a roosting Commerson’s Leafnosed Bat next to the restaurant. Four lifers in 2 hours. Madagascar was living up to my expectations. Just before 7 we set off for a night walk. Spotlighting is now banned inside all of Madagascar’s national parks but in Ankarafantsika at least that doesn’t seem to be much of a problem, as the key species can all be found along the road and around the accommodation. As soon as we left my bungalow Jacky heard a Milne-Edward’s Sportive Lemur and we had reasonable views of an animal up in the canopy. 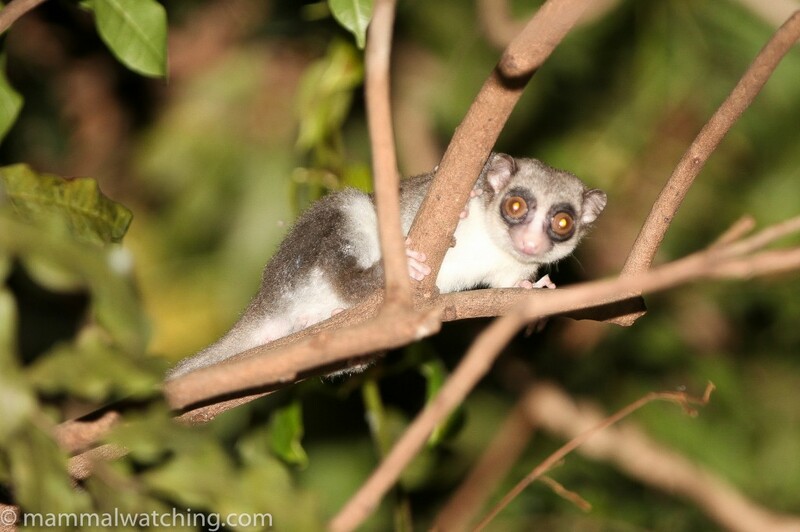 During the next 90 minutes we found at least 6 Grey Mouse Lemurs (with remarkably bright eyeshine for such a small animal), 3 Fat-tailed Dwarf Lemurs, another Commerson’s Leaf-nosed Bat and a Western Tuft-tailed Rat. That just left Western Avahis and the Golden Brown Mouse Lemur. We went out again after dinner and Jacky found quickly a couple of Golden Brown Mouse Lemurs, another Grey Mouse Lemur and I spotted a rat in a tree, that was just a Black Rat. We didn’t put more effort into finding an Avahi (Woolly Lemur) as Jacky knew some day roosts we could try in the morning. 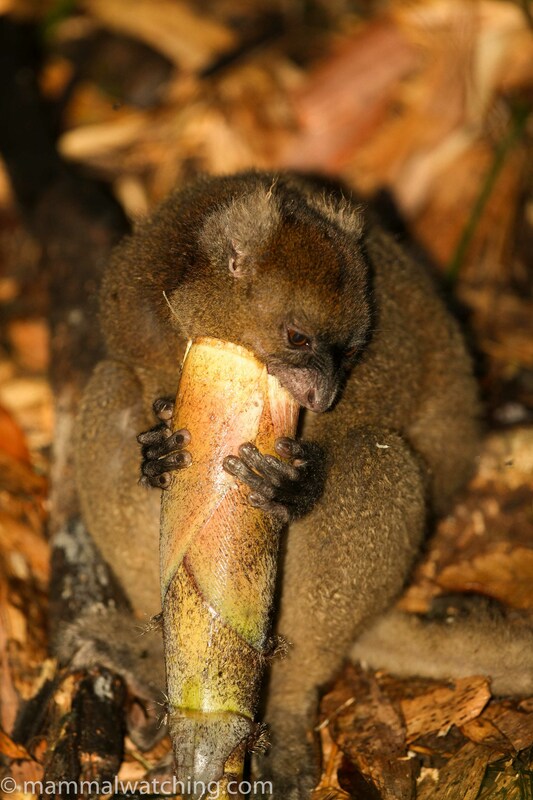 Finding both Grey and Golden Mouse Lemurs on the same evening seems to be pot luck. Though both species are apparently very common they can be hard to track down, and perhaps they have different bursts of activity. 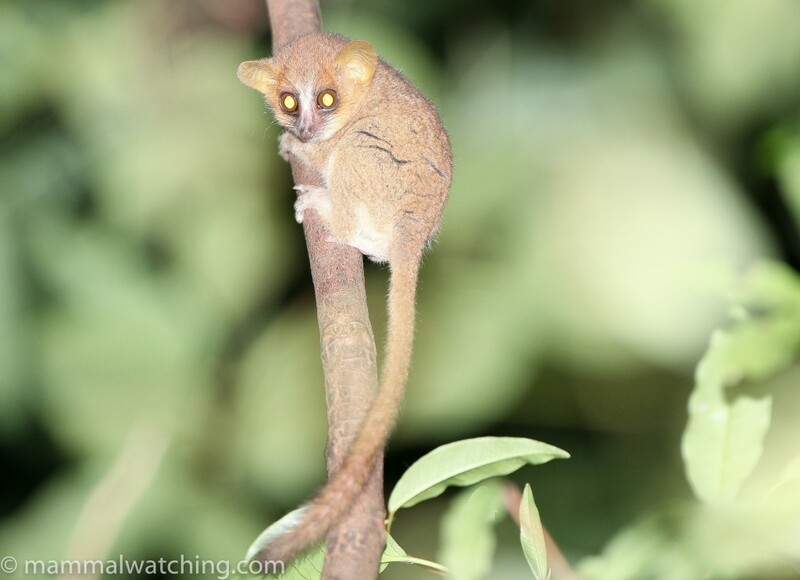 It does seem statistically unlikely that we would see seven Grey Mouse Lemurs in a row, followed by two Golden Brown lemurs. Anyway, if you don’t see both then persevere. The next morning, during a two hour walk, Jacky found a pair and then a single roosting Western Avahi, nestled in tree forks. The first pair, at least, were in a new nesting spot and I’ve no idea what drugs Jacky was taking to have been able to spot any of the animals (I struggled to see the last one through binoculars when Jacky had a laser pointer on it). We couldn’t find any roosting Milne-Edward’s Sportive Lemurs in several of their regular tree hollows. Jacky thought they had found new dens for the rainy season. Jacky saw some movement that may have been a Tenrec and we saw a few more Sifakas and a couple of troops of Brown Mongoose Lemurs. 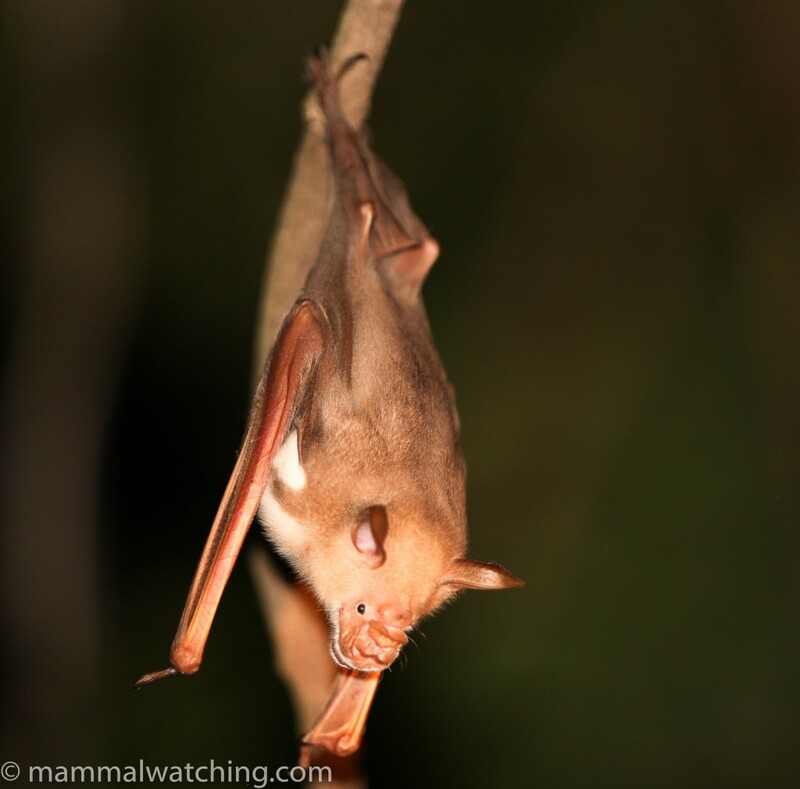 As a last gift, Jacky found a lone Mauritian Tomb Bat roosting on its usual tree in the campsite. Not very much here. If I had stayed an extra night I would have had a more serious crack at the two commonish Tenrec species there (the Common Tenrec and Greater Hedgehog Tenrec), and perhaps bumped into a Big-Footed Tree Mouse. Before leaving the park Fano introduce me to Kelly, a South African researcher, studying tenrecs and Big-footed Tree Mice in the park. She was good enough to show me some captive animals, and very interesting to talk to. She was excited to have discovered the day before that one of her radio tracked male tenrecs appeared already to be aestivating, having been above ground for just 2 months. 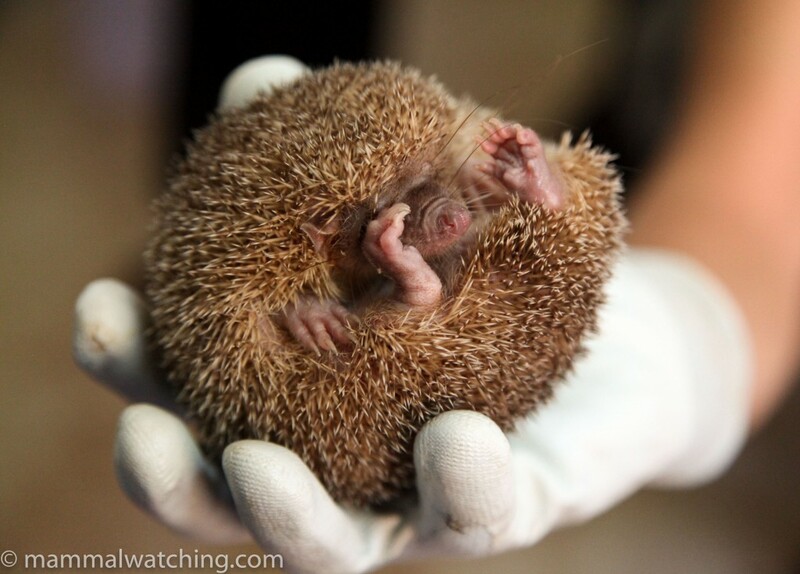 Her study was pretty innovative too: tenrecs don’t have necks she had to surgically implant the radio tags. 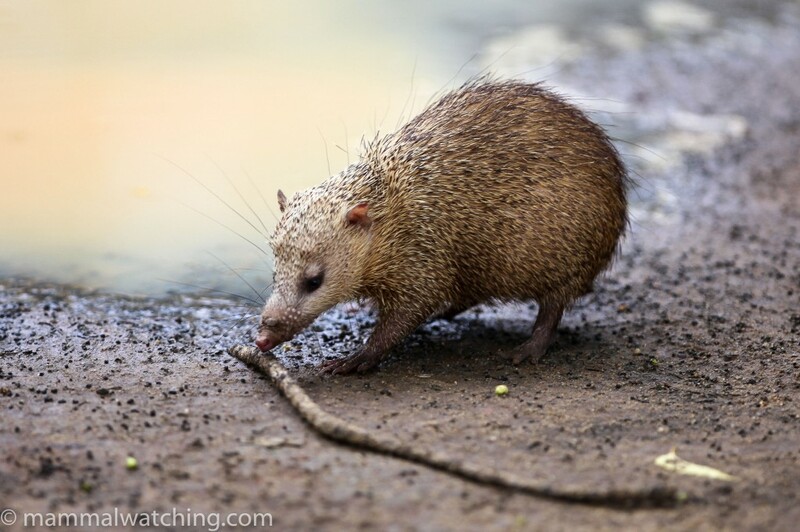 Kelly explained that her tenrecs were all caught by hand (though beware their nasty bite), and were fairly easy to track down by walking quietly at night and listening for their rustlings. One of the things I enjoyed most about the first part of this trip was the back to basics approach of using public transport. I’ve no problem with that generally, it is usually just a lack of time that pushes me towards hire cars. But with Fano helping to organize everything it was often just as quick to travel by public transport and obviously a fraction of the cost. It was also fun. The journey from Ankarafantsika to Katsepe was no exception. Fano flagged down a taxi brousse outside the park HQ for the 2 hour trip to Mahjunga. The bus was jammed full of people but Fano bought us a spare seat so we could “relax” in the front. My one concern was the goat tied to the roof rack within munching distance of my bag. After 30 minutes too many passengers got off the bus to make it worth their while continuing so we, and the goat, had to change to another vehicle. At Majunga we swapped straight onto a small, and overcrowded pirogue to take a trip across the bay to Katsepe. There were 20 people on the 5 metre long boat which was barely clearing the water, the sea was choppy, the outboard didn’t sound reliable and there was as much chance of a radio on board as an emergency flare. But the crossing was only an hour, and I was more worried about losing my camera than my life. Fano planned for us to spend the night at the little hotel at Katsepe and get a taxi to take us to visit the forest fragment next to the lighthouse to see the Crowned Sifakas that hang out in the mango trees there. But we didn’t have to travel that far. A couple of Crowned Sifakas had recently taken up residence in the hotel garden. So I spent the rest of the day and night eating some spectacularly good prawns, swimming and snoozing. Meanwhile Fano put out the word that we wanted to see a Tenrec but none was found. A long day travelling from Katsepe to Tana: 40 minutes on a fishing boat followed by 12 hours in a second class taxi brousse (second class means they stop more often, take more passengers and have seats that would be better as a medieval torture implement than something to sit comfortably on). In Tana I stayed and ate at the very nice and very cheap Sakamanga hotel and saw in the New Year watching a local band while surrounded by some of Madagascar’s finest prostitutes. Indri, Indri indri … Oi Oi Oi! Andasibe and Mantadia National Parks (formerly known as Perinet) are 3 hours from Tana. Fano arranged for a car, and his buddy Dama the driver, to take us there. We checked into the perfectly adequate (unless you wanted your food in a hurry) Mikalo hotel. After a very good gourmet lunch at the fancy new Andasibe Hotel we headed into Andasibe National Park at 14.30 with Julien our local guide (who again was fabulous). 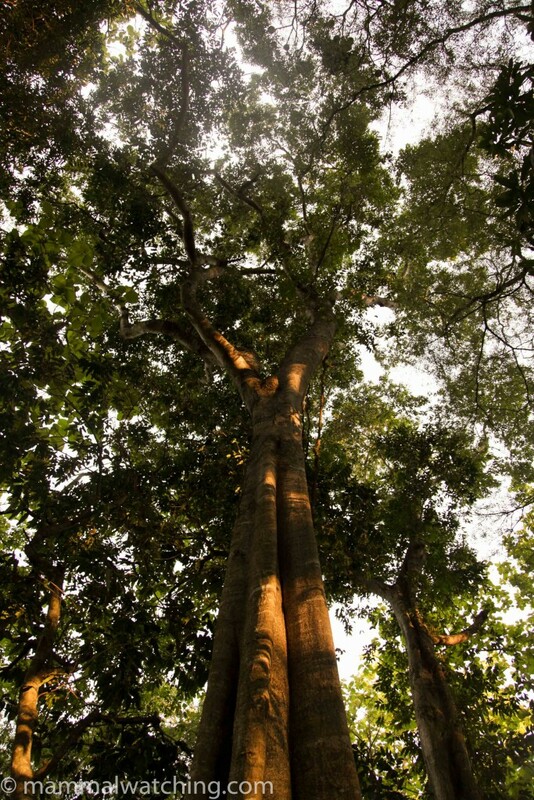 Andasibe is a fairly small piece of secondary rainforest. We easily found a group of four Indris and had excellent prolonged views of them. What a mammal and what a way to start 2011! They call early in the morning and in the late afternoon and it’s a call well worth hearing. Sort of whale song meets gibbon meets Spotted Hyena. Julien tracked down a gorgeous Lowland Streaked Tenrec that we heard rustling just before 4 p.m. near a concrete drainage channel (one of their favourite spots). The park shuts at 4 p.m. so we left without seeing any roosting Eastern Woolly Lemurs, or finding any Eastern Grey Bamboo Lemurs. We set out just before 8 p.m. for some spotlighting along the road and in the forest behind the hotel. We found about 10 Furry-eared Dwarf Lemurs, 3 Goodman’s Mouse Lemurs and a pair of Eastern Avahis, but no Weasel Sportive Lemur. Mantadia is a lot bigger than Andasibe. The primary rainforest is much better looking but the mammals are a little harder to find. 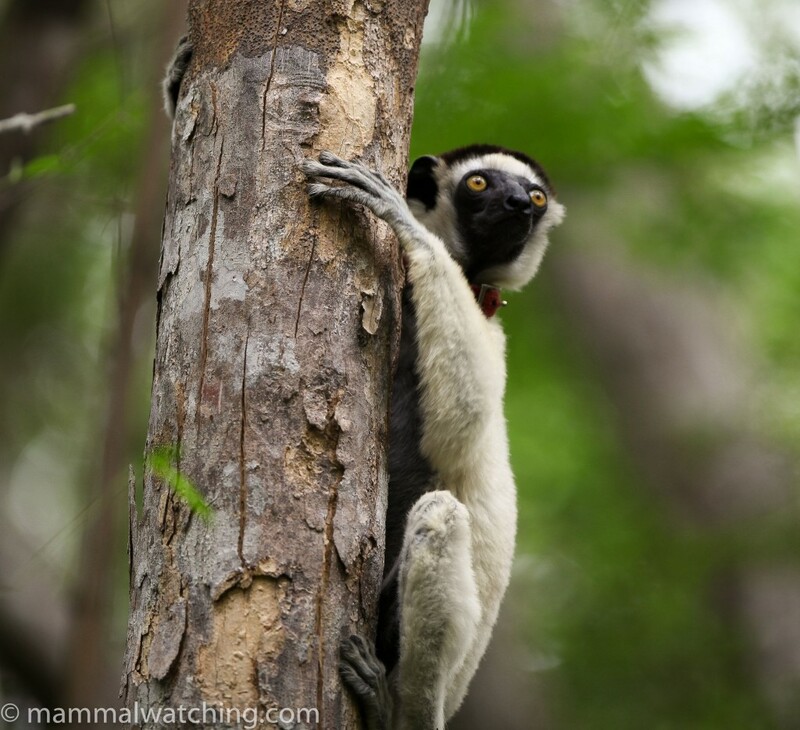 The key species here are the Diademed Sifakas and the Black and White Ruffed Lemurs. We found a group of Indris on top of one side of the valley at 9 a.m. but not the Sifakas that had been with them 20 minutes earlier we were told. An hour later we found the first Sifakas along the road, and went on to see another 2 groups during the day but it was hard to get photos. 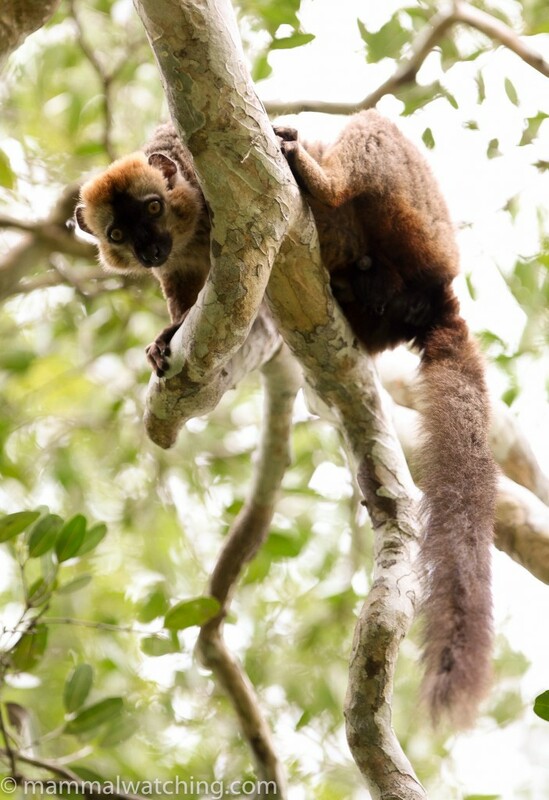 At 11 a.m. Fano spotted a group of Eastern Grey Bamboo Lemurs near the parking area and we had good views of five animals. We also saw a group of Brown Lemurs before lunch. The Black and White Ruffed Lemurs were a challenge however. They were calling – distinctively and noisily – quite often between 9 a.m. and 11 a.m., but never for very long, In hindsight it would have been better to have tried for them first. After 11 a.m. their calling became more sporadic, perhaps just once every hour. And we spent the rest of the day trying to see them slowly getting closer after each bout of calling. The park closes at 4 p.m. and at 3.50 p.m. 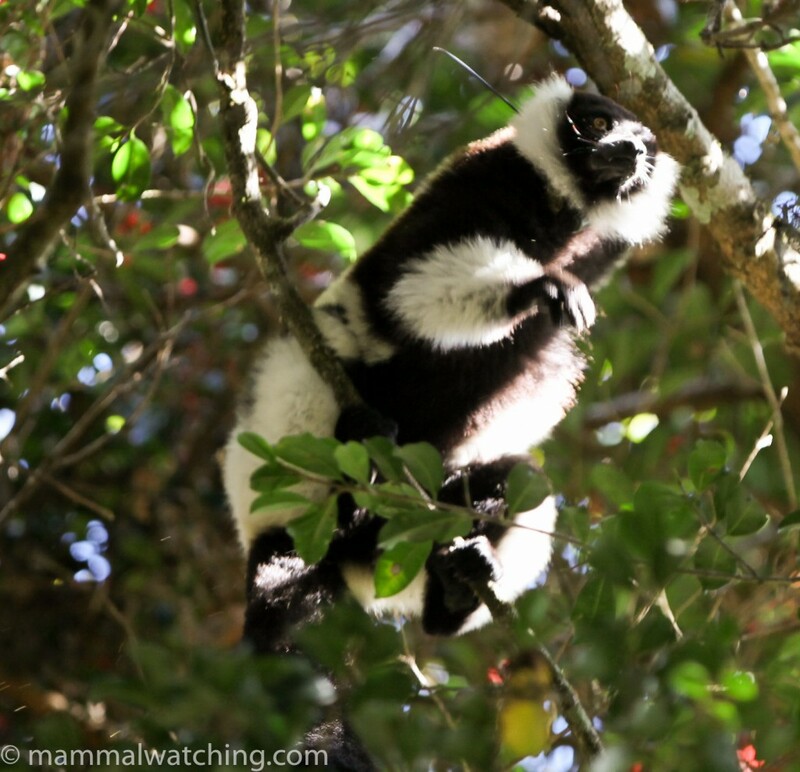 I heard the lemurs calling again from just off the road and then heard the calling of Fano and Julien. They had a pair of animals in their sights and 5 minutes later so did I. Spectacular animals and worth the stress! They don’t stay still for long and move quietly and quickly so I appreciate why they are hard to get onto. 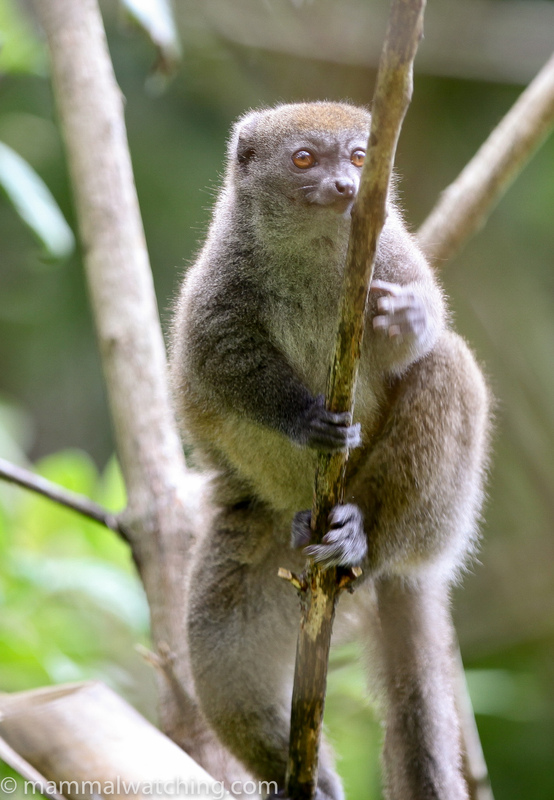 Weasel Sportive Lemurs are fairly common and findable. One had been seen the night before we were there. They apparently call most just after dusk so perhaps we should have looked for them before we had had our dinner. Some roosts – in hollow trees – are known to the guides but they tend to use these roost holes more in the dry season. Hairy-eared Dwarf Lemur. Although Nick Garbutt’s book suggests these are common in Mantadia the sites are no longer accessible because the park is closed at night. No one was aware of any site outside the park. 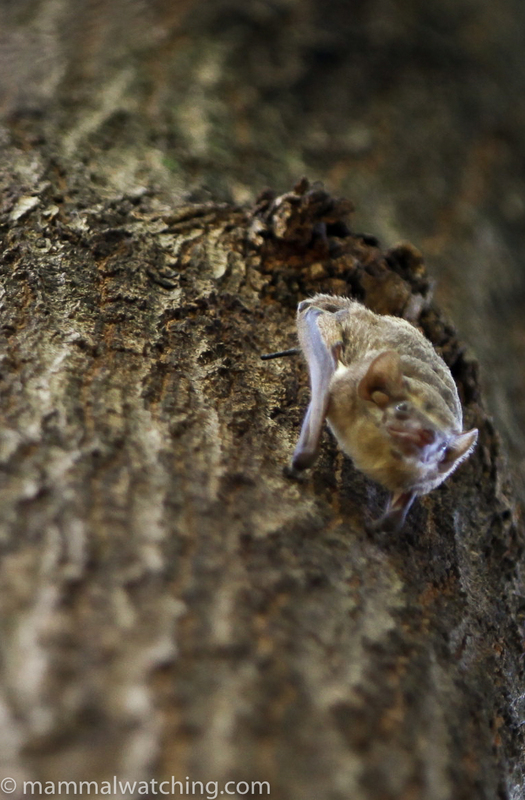 There are Aye-Ayes in the park. But Julien had seen 8 in 21 years. So not likely. I spent the night of 2 January in Tana, this time in the Aina hotel. I think I have stayed in worse places. But never when I had another option. Ranomafana is a lovely slab of rainforest, on the side of a valley. Most of the action happens up at 800 to 900 m around the park’s main entrance. 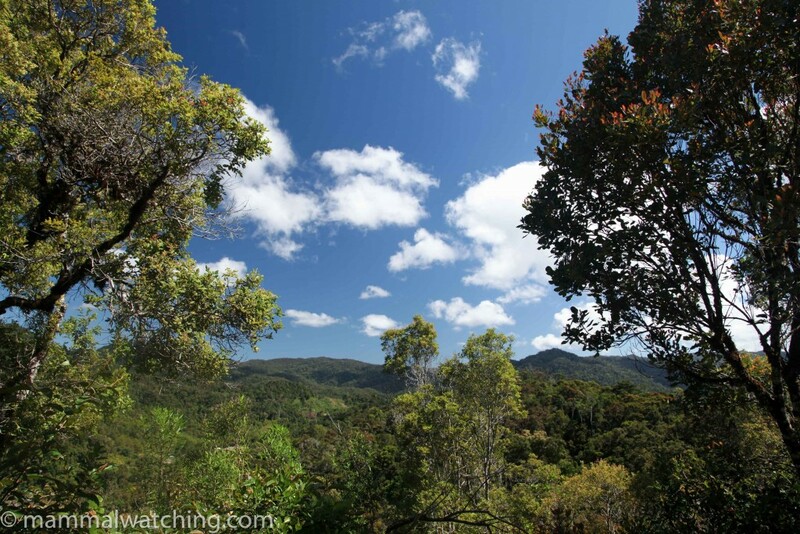 We also visited a higher section of forest back up the road at Vohiparara to look for Sifakas and Sportive Lemurs. It’s a 10 hour drive from Tana to Ranomafana. We arrived about 16.30 and met up with Loret our guide, who once again was excellent and highly recommended. He has been involved with the park since before it was gazetted, and was accompanied by two trainee guides. He’d staked out some Golden Bamboo Lemurs in one of their favoured stands of bamboo about 20 minutes from the entrance. Nice views but it was difficult to get good pictures in the late afternoon light. The park was created following the discovery of this species. After seeing the Golden Bamboo Lemurs we wandered up to the Bellevue lookout. The park used to have regular animal feeding in the evening’s here and Fanalokas, Ring-tailed Mongooses and Brown Mouse Lemurs used to turn up for a free feed. But in 2008 this was stopped, at the same time that every national park was closed at night. Ringtailed Mongooses still hang out around Bellevue and sometimes appear in the hope of food when they hear people. They didn’t appear for us. We returned to the road and headed up towards Vohiparara. Loret took us to a small cave just off the road next to a bridge. A couple of bentwing Bats were hanging from the ceiling and we grabbed one. The measurements suggest it was probably a Major’s Bentwing (forearm of 46mm and 10g in weight). 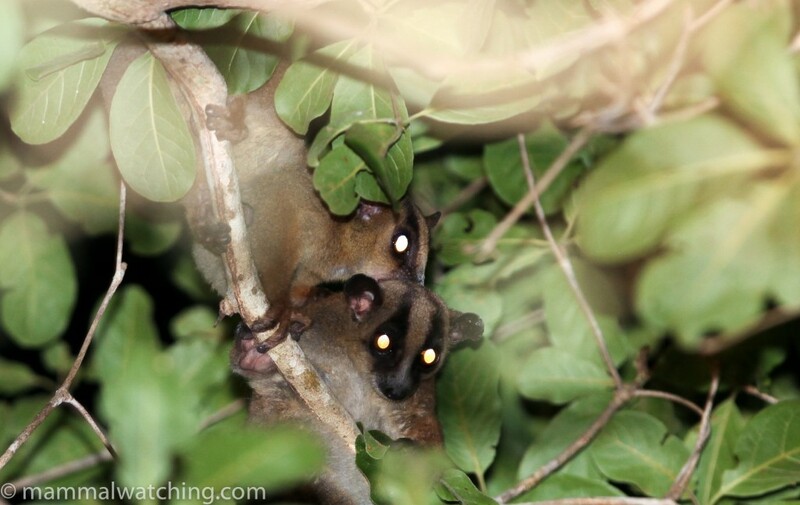 Nearby we saw a couple of distant Red-fronted Brown Lemurs still active at sunset. Meanwhile the guides had baited a couple of roadside trees with smeared bananas to attract Brown Mouse Lemurs. And sure enough a couple arrived on dusk. Loret was skeptical about our chances of seeing Greater Dwarf Lemurs as none has been seen in a month or so he reckoned. But I wanted to try and we walked down the road from Vohiparara also looking for Small-toothed Sportive Lemurs that are apparently more common up there. No luck. We stopped walking after half an hour. But I shoved a light out of the car window and immediately picked up very bright eyeshine across the other side of the river. 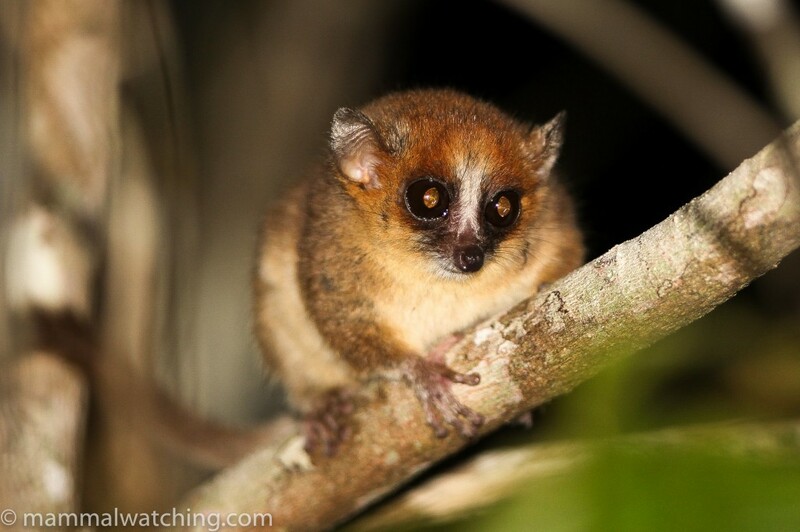 A Greater Dwarf Lemur. In fact there were 3 of them in a couple of large neighbouring trees. Spotlighting along the Ramofana road by vehicle might be more productive than walking I suspect. The good spotlighting window across the river and the extra distance you could cover might be a beneficial trade-off here for not being able to hear much. 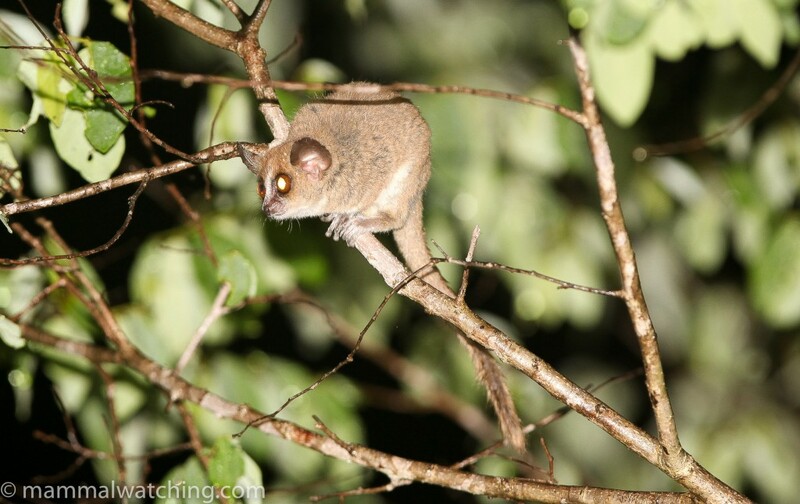 Indeed we picked up another Mouse Lemur from the vehicle too. There are chances for Aye Aye, Fanaloka etc. along the road but Dama had been driving since 6 a.m. and it didn’t seem fair to keep going beyond 8 p.m. Though I think the untiring Dama would have if I’d asked him. We slept in the perfectly adequate new Grenat hotel. We were back in the park at 7am. It drizzled heavily most of the morning, with a couple of bouts of serious rain and this obviously made lemur spotting tricky. 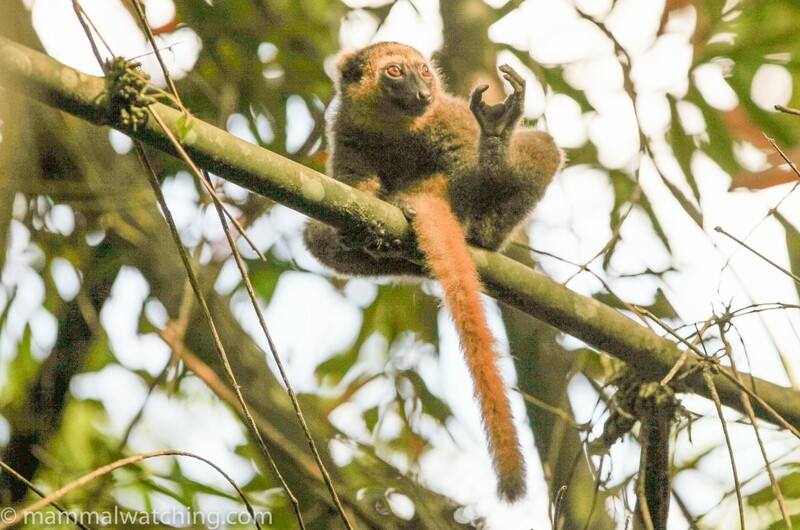 The guides found some Eastern Bamboo Lemurs and a Lowland Streaked Tenrec, both of which I didn’t go to see as I was chasing the Greater Bamboo Lemurs and Milne-Edward’s Sifakas. 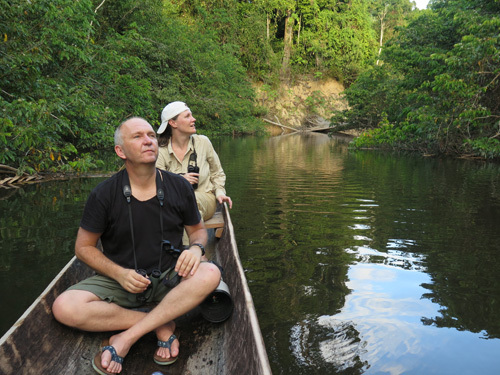 During 6 hours we heard the Black and White Ruffed Lemurs calling and saw a couple of Forest Rats, one of which Loret positively identified as Eastern Red Forest Rat. The Lowland Red Forest Rat is equally common here Loret said, and he also said they are easier to distinguish than you might imagine from Nick Garbutt’s book. The lowland flavor has a white chest. 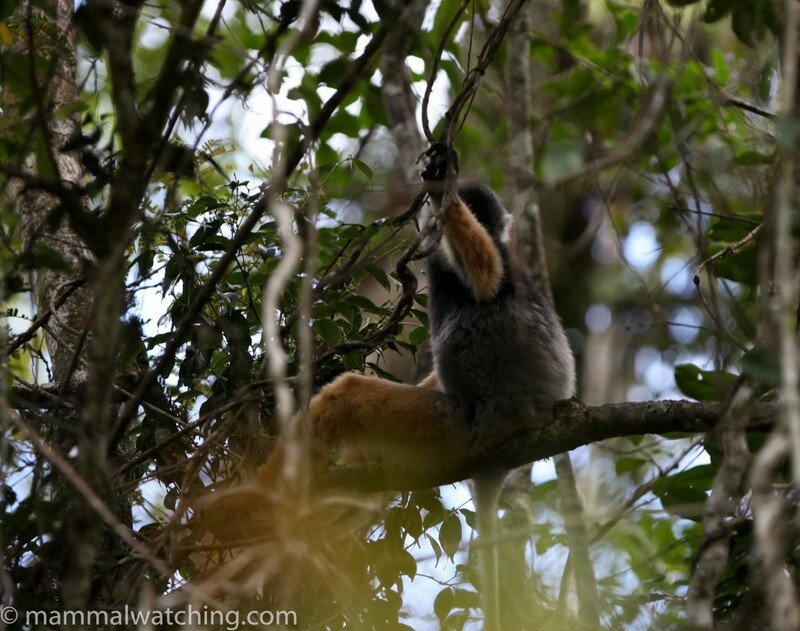 During a short break in the weather we found a couple of Red-bellied Lemurs. 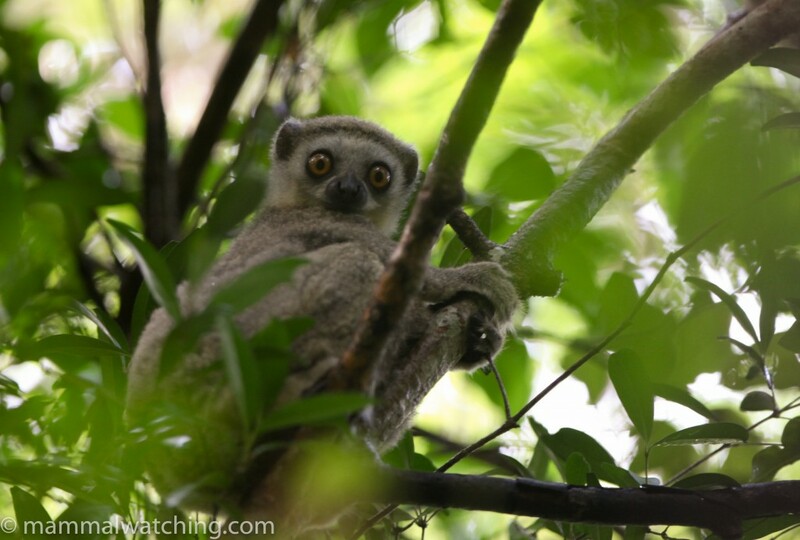 But none of the park guides managed to see Greater Bamboo Lemurs or Sifakas so by 12.30 we decided to cut our losses and head down to the Anja Park to see Ringtail Lemurs (two and a half hours to the south – see below). We were back in Ranomafana by 18.30. It had rained all day and no one had seen a Greater Bamboo Lemur or Sifaka. The hotel we had used the night before was full so we moved to the Manja Hotel. This was a lucky move. 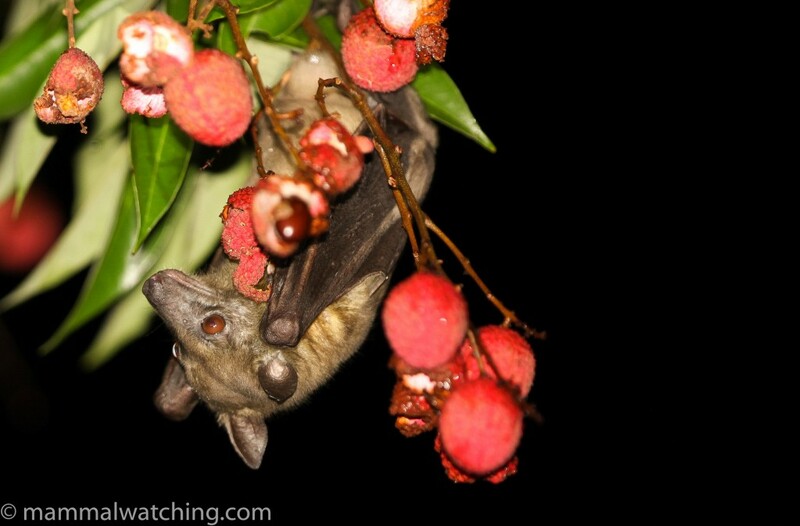 The garden had several Lychee Trees in full fruit and I spotted a couple of Madagascan Straw Coloured Fruit Bats feeding in one after dinner. An unidentified rat was in one too – probably just Rattus rattus. The next morning the sun was out. We were at the park by 6.30 and Loret had already dispatched the trainees, who had found a couple of Greater Bamboo Lemurs. Great views of one of the world’s 25 rarest primates. We spent the next 2 hours climbing up higher above Bellevue looking for the Sifakas. It seems that just one group of 3 live in a large territory. They don’t call often either. So they were more difficult to find than I’d anticipated despite the dozens of guides looking for them every day (all the guides in Ranomafana share information on what they have seen). We didn’t succeed. But I did see another Red Forest Rat, probably an Eastern. 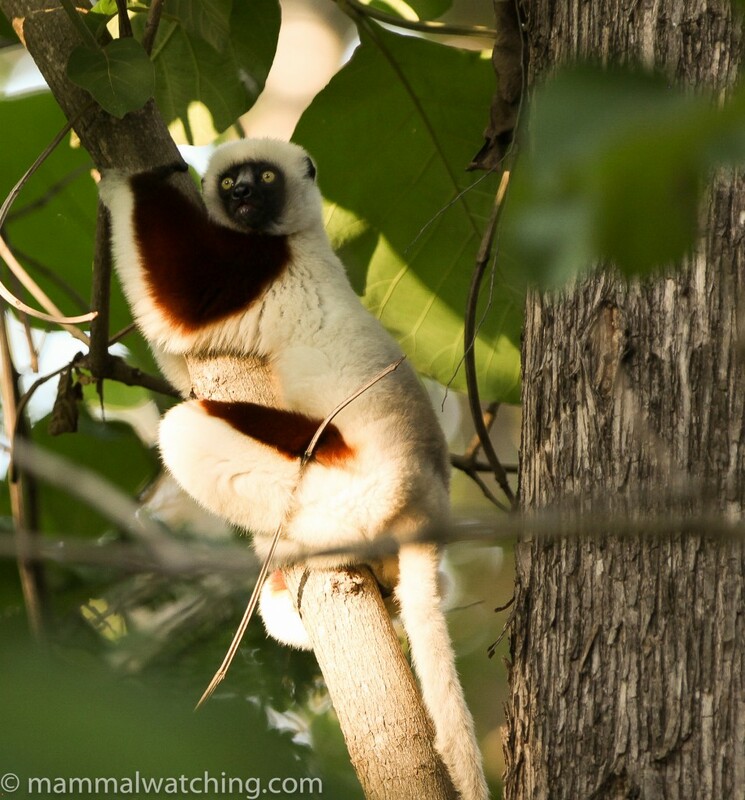 Another two groups of Sifakas live up around Vohiparara so we spent another couple of hours up there looking around. We didn’t see any mammals: no Sifakas and no Small-toothed Sportive Lemurs which can sometimes be found in nest holes, though mainly in the dry season I think. Once again none of the guides had found a Sifaka anywhere in the park so we reluctantly decided to give up and set off on the 5 hour drive to Antsirabe. Once again we missed the local Sportive Lemur species here. 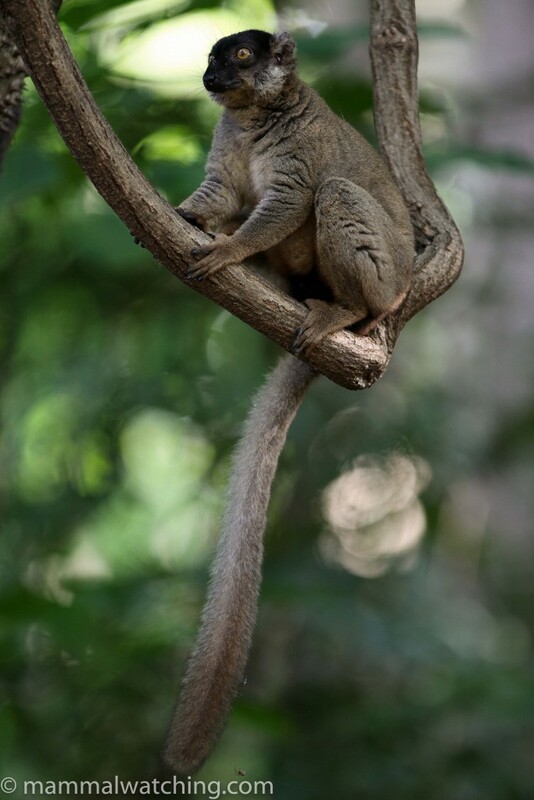 I think Small-toothed Sportive Lemurs are are generally easier to find in the dry season when they can often be tracked to a favourite nest hole. In the rainy season they move to a nest in vines. 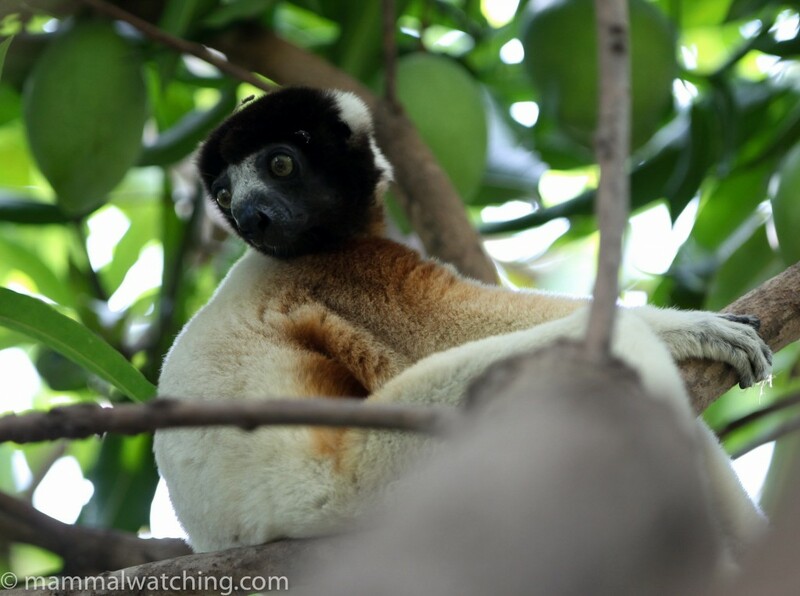 Missing the Sifakas was a disappointment (but – spoiler alert – we returned on my last day and saw some). The bad weather wasted a morning, but the Sifakas aren’t very easy to find, especially when the researchers aren’t in the park radio tracking them (and they weren’t when I was there). 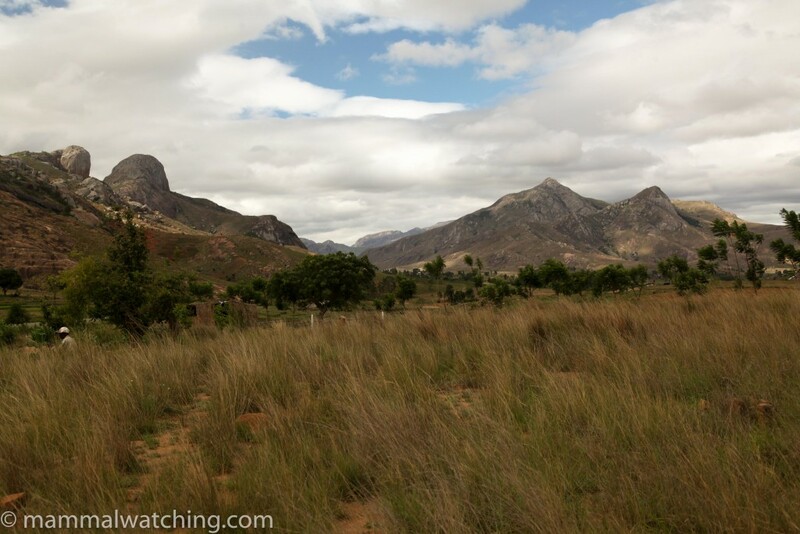 With better weather we might well have seen a Ringtailed Mongoose and with a little more time we would have probably bumped into a Lowland Forest Rat. Phil Telfer was shown a White-tailed Rat in a tree hole while he was here so that’s worth enquiring about. Finally the locals set a live trap for Aquatic Tenrec but weren’t successful. 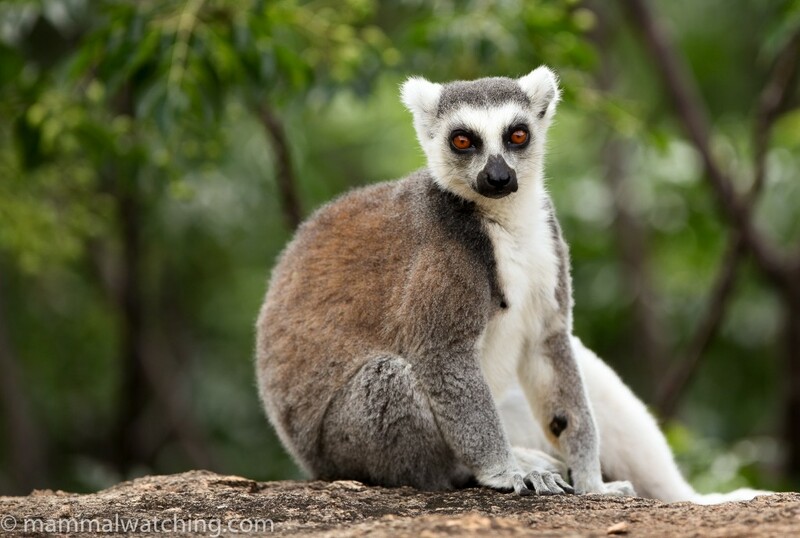 This little community-run park, set up to protect a few hundred Ringtailed Lemurs and provide the villagers with an income stream, is well worth a visit. It is just two and a half hours from Ranomafana. We went, saw the lemurs, and were back in under 6 hours. The Ringtails are easy to see, apparently in much better condition than in Berenty, and the scenery is pretty speccy too. Plus a visit helps protect the animals. 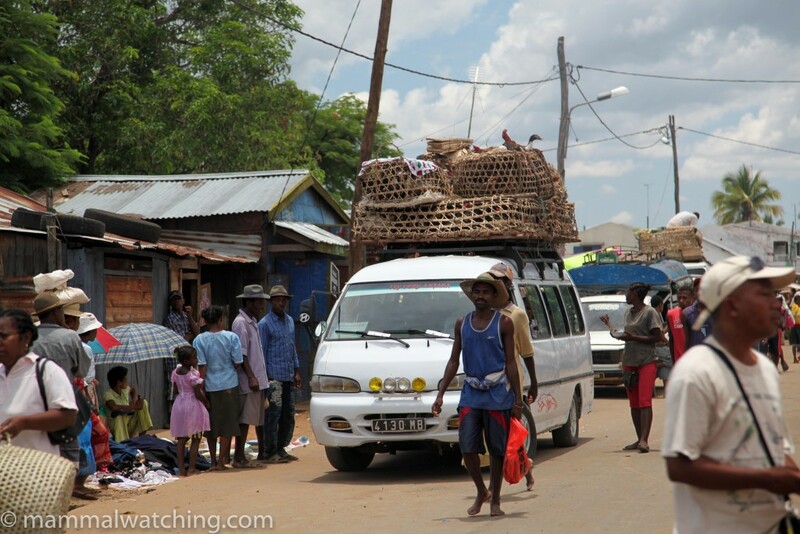 Fano reckoned it would take 10 hours to drive from Antsirabe to Morondava, gateway to Kirindy. We did it in 8. Partly this was because the road was in decent shape save for the last 40 km. And partly because Dama was wearing his Michael Schumacher Team Ferrari shirt. This usually signals a day of particularly courageous overtaking. At Morondava we waited for an hour before connecting with the 4wd that was to take us to Kirindy. 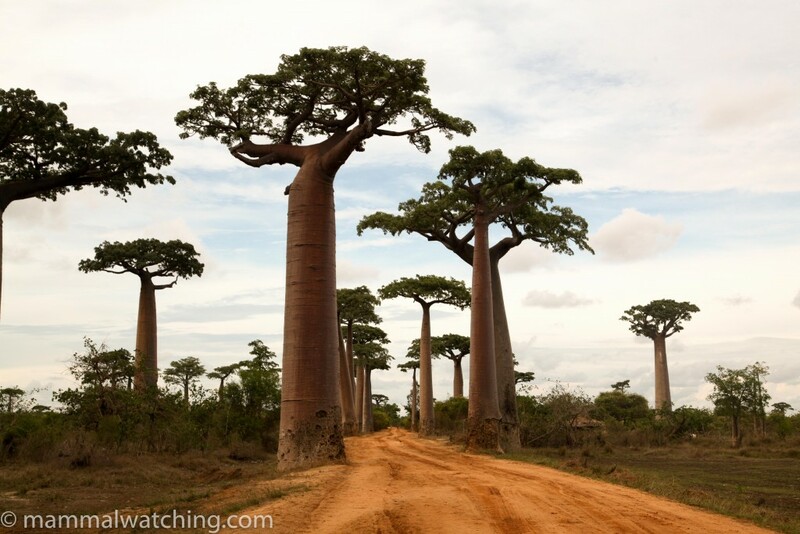 It’s another 2 hours from Morondava to the park, and the journey includes the well known and photogenic Avenue of the Baobabs. We reached the park gates about 5 p.m. It had rained heavily that morning and perhaps that explained the extraordinary number of Hog-nosed Snakes along the road (we saw 5 in the first kilometer). 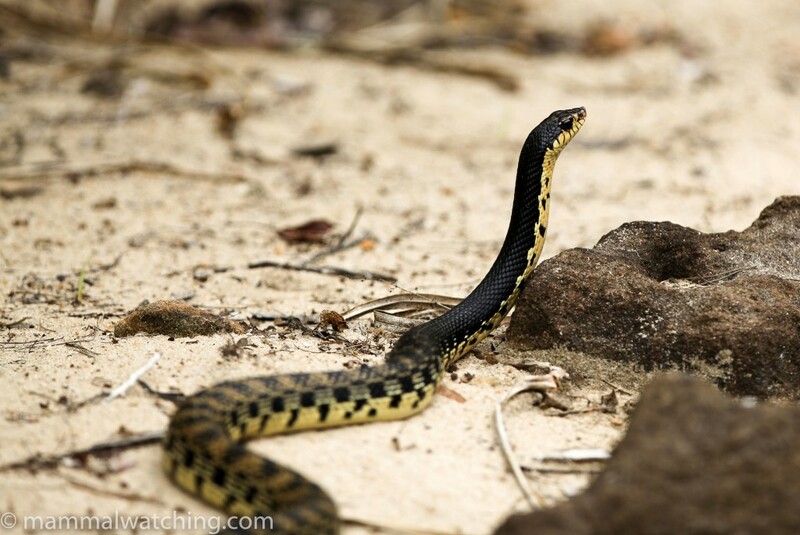 The snakes were followed by 3 Narrow-striped Mongooses on the road which I was able to walk to within a few metres of. Strange animals. Priscilla Queen of the Mongooses … delicately structured and long legged. And Kirindy is about the only place to see them. We were at camp by 17.30 and I enjoyed an almost cold Three Horse Beer sitting in the rondavel dining area, the air heavy with the anticipation of the animals to come. 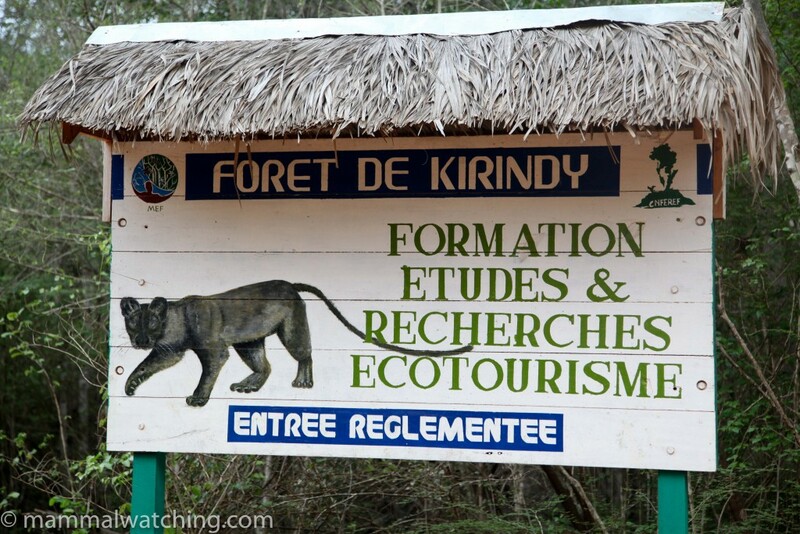 Kirindy is famous for its Fossas. They were studied here intensively and there are usually habituated individuals hanging around camp (see Coke Smith’s report for example). 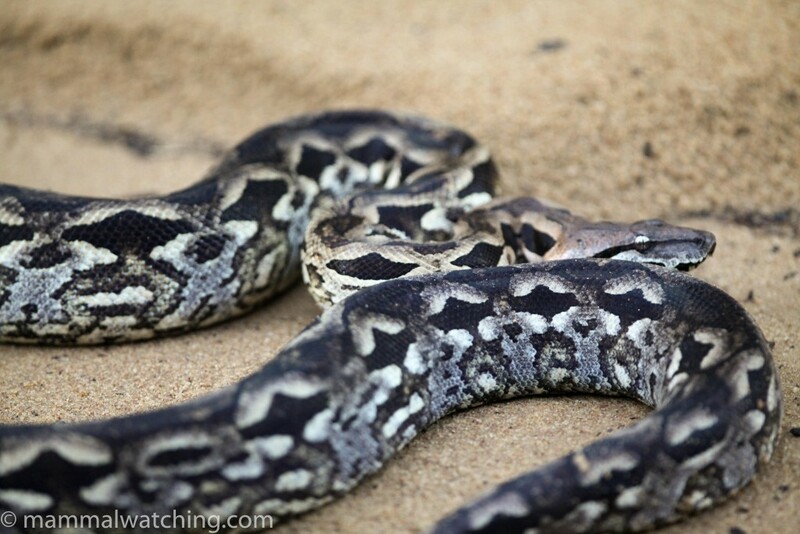 But the Fossas had headed bush a few days before I got there. I wasn’t overly disappointed. A Fossa is one of Madagascar’s must see mammals for sure, but I’d prefer to have to work a bit to see one (or be lucky) rather than find them waiting for me in camp. It does seem however that Fossas are declining worryingly in the park. The camp might be basic, but the chef is a woman of culinary talent. So after too much dinner we headed out with Christian, the local guide, into the forest. It is interesting how each guide has their own spotlighting technique. Christian moves surprisingly quickly and I wondered if he would be able to hear anything moving. But my worries were misplaced – he was excellent. 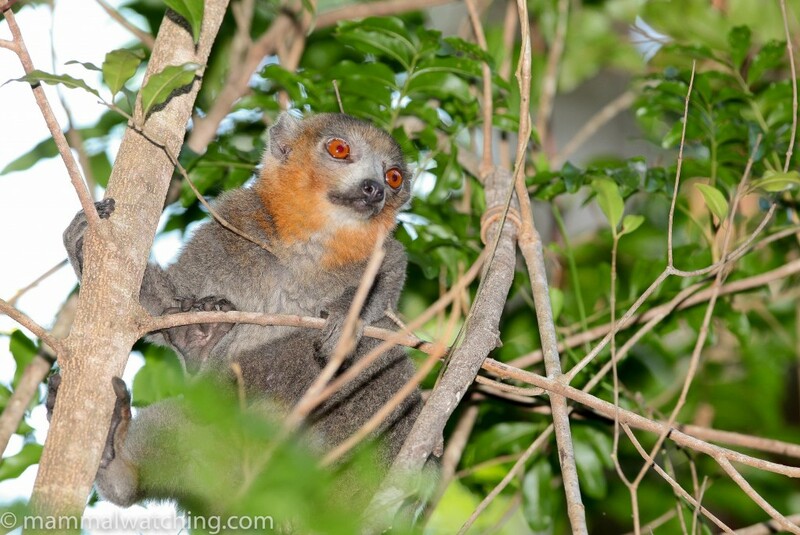 During 3 hours we saw (and heard many more) Pale Fork-marked Lemurs and Red-tailed Sportive Lemurs. Both species call loudly here. Fat–tailed Dwarf Lemurs were also quite common, and we spotted several along the road near camp. 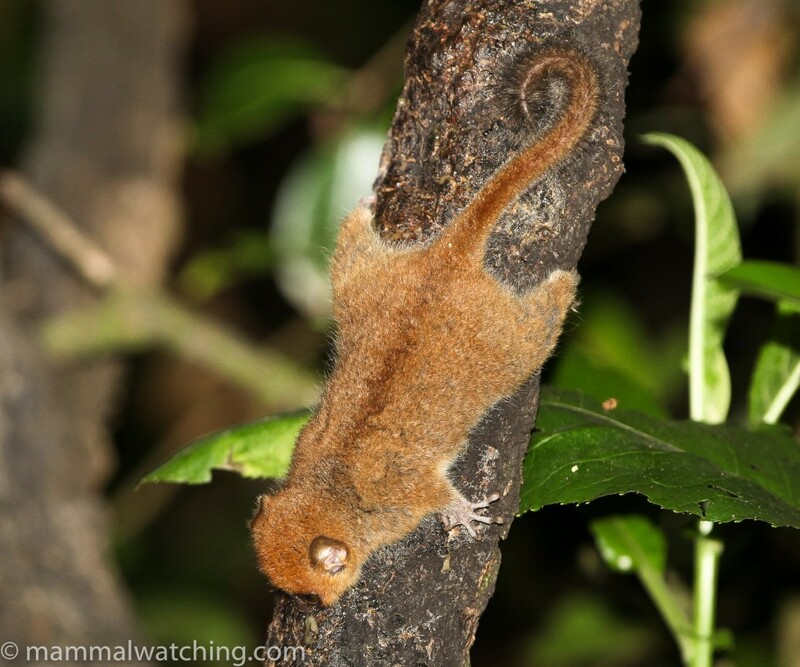 Madam Berthe’s Mouse Lemur, another Kirindy specialty, is the smallest primate in the world which explains why it’s one of the harder mammals to find here. But Christian found one and I got a short but good look at it. 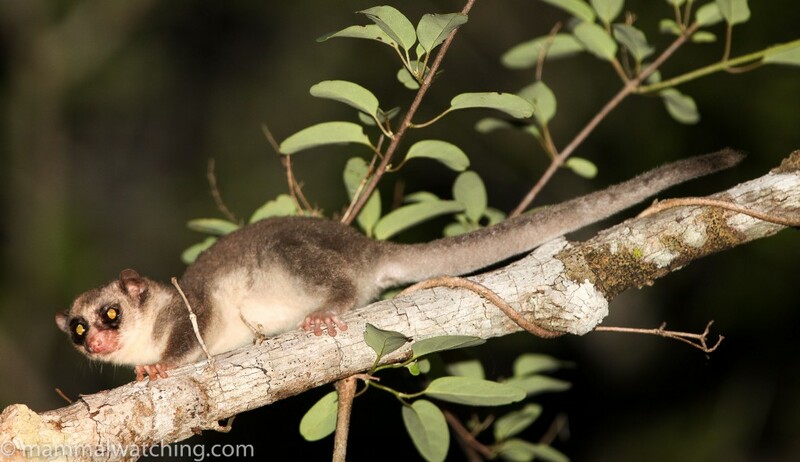 He also found a Grey Mouse Lemur. 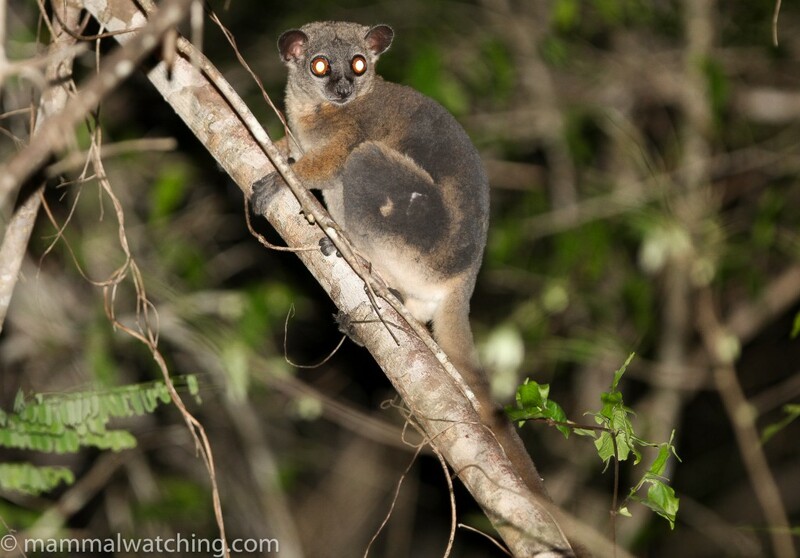 No such luck with the last nocturnal lemur in Kirindy: Coquerel’s Giant Dwarf Lemurs are usually pretty common but apparently hard to see in December/January. Christian hadn’t seen once since late November. He thought they might have young and that the lemur pairs were remaining in or around the nest (though Nick Garbutt quotes research saying they mate in November and have a 90 day gestation so both theories cannot be correct). Christian also said they have a distinctive smell so you can usually tell if they are around. 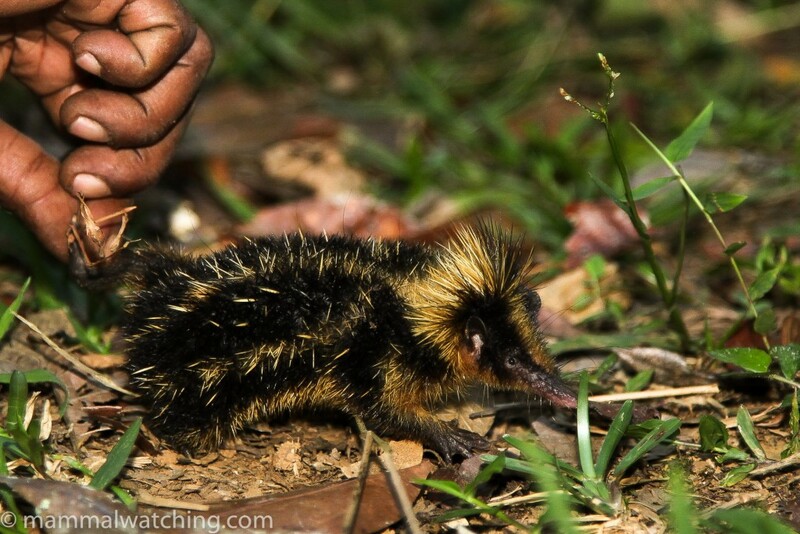 Christian heard a Common Tenrec and I got a quick look at one waddling fast into the bush. 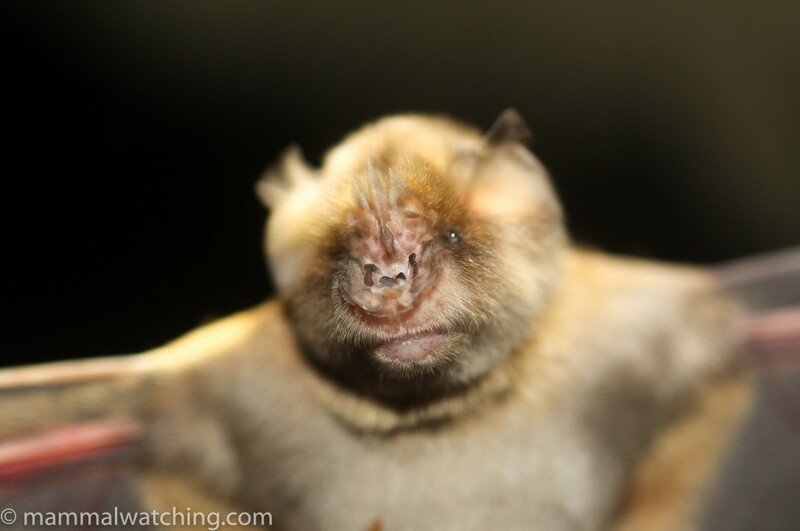 Although they are widespread, bushmeat poaching makes this species a tricky one to see. Ay 9 p.m. we found our first fabulous Giant Jumping Rat on the road. 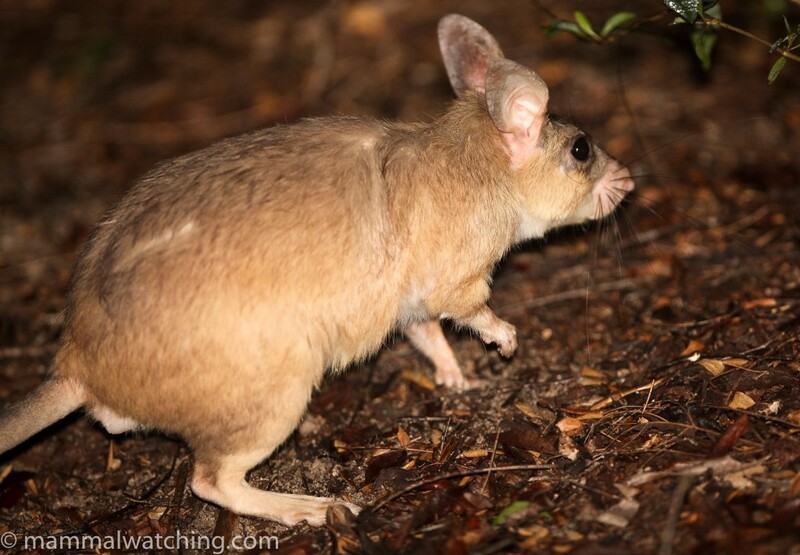 A Madagascan Bilby! 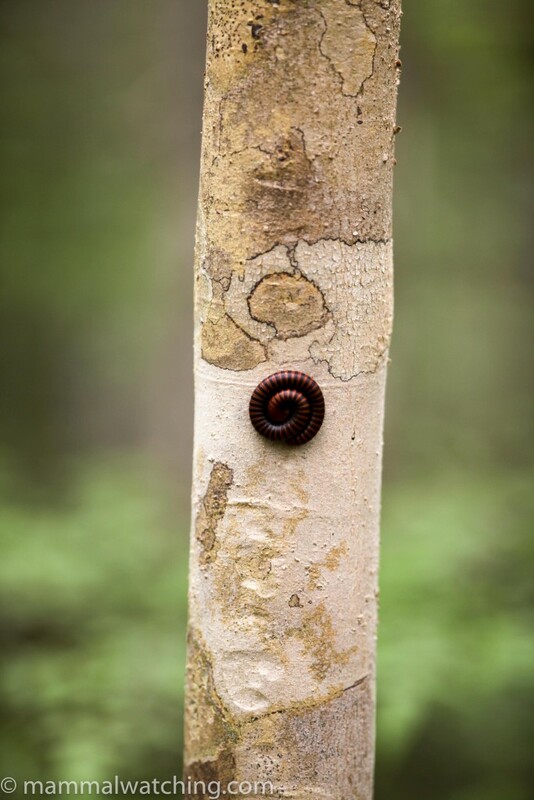 This species is a definite incentive to visit Kirindy. Again I could approach closely. The rats are apparently easier to see in the wet season, but often better found after midnight (though the park staff will find them in the early hours and wake you if you don’t want to wait up). Back at camp, my room – and especially my bed – had been carpeted with the wings of flying termites. Someone had left the lights on, so when the generator was fired up every flying termite in the vicinity came to see what was up. I got up at 4am for a predawn walk on my own and to try again for the Coquerel’s Giant Dwarf Lemur. No lemurs but I followed a couple of Giant Jumping Rats for 30 minutes along the road near camp. After breakfast, Christian took us out for 3 hours in the forest. 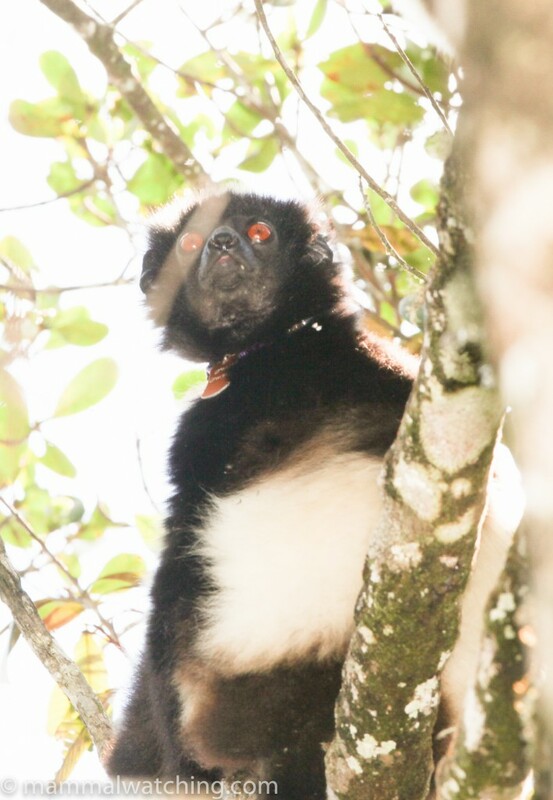 Verreaux’s Sifakas were the main target and we found several groups (including some back at camp) though it took us 2 hours to find our first. 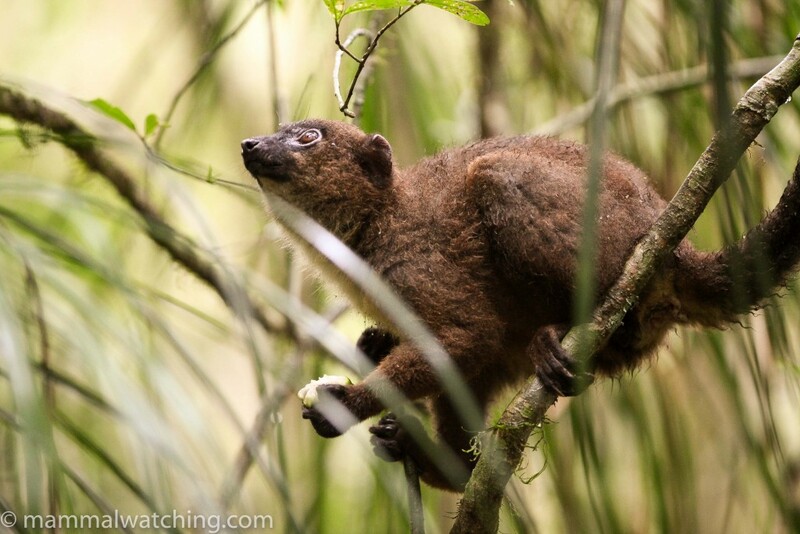 We also had very good views of several groups of Red-fronted Brown Lemurs. Most of both species we saw were collared. Not radio collared, but dog collared with an ID number. I suppose there is some useful purpose to this …. But no matter the good intentions it is quasi-vandalism. Christian also checked a couple of nest boxes and found a group of 3 Grey Mouse Lemurs. We also saw at least two Red-tailed Sportive Lemurs in day roosts. After an afternoon’s rest me and the other members of the Tenrec Liberation Front gathered for a photo shoot. Fano had sent our driver to the local market and asked him to purchase a Common Tenrec if they were being sold live for the pot. He did. The beast had almost certainly come from the park so we decided to take some pictures and let it go and I got a better look at this animal than I had the night before. It was pretty groggy but eventually shuffled off and was last seen burying itself under a pile of brush. 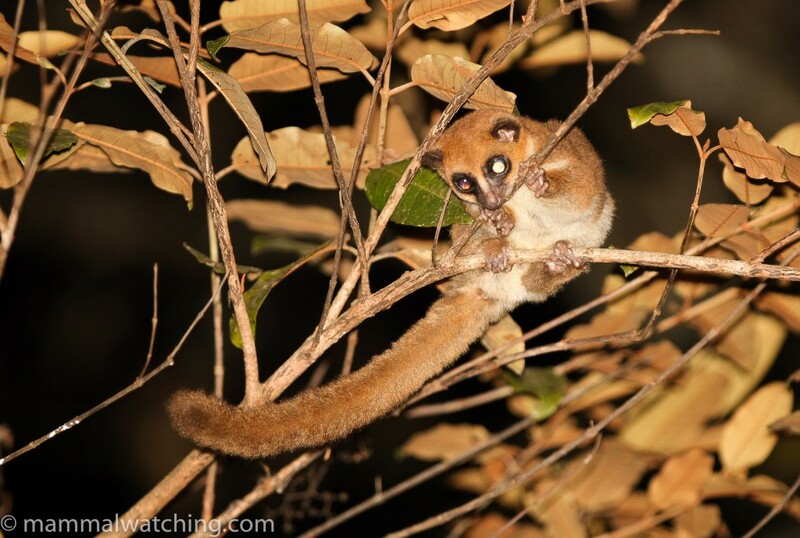 Christian thought that perhaps the Coquerel’s Giant Dwarf Lemurs might be findable at dusk (last night’s expedition started an hour later) so off we went. 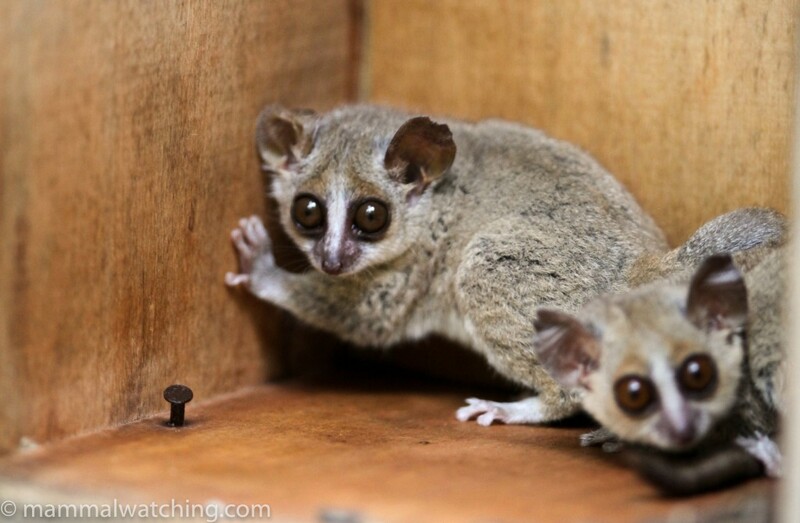 No Coquerel’s but more Pale-fork Marked, Sportive and Grey Mouse Lemurs and another Giant Jumping Rat. I’d had permission to put a mist net up next to camp and there were several Commerson’s Leaf-nosed Bats plus a Trident Leaf-nosed Bat in the net. 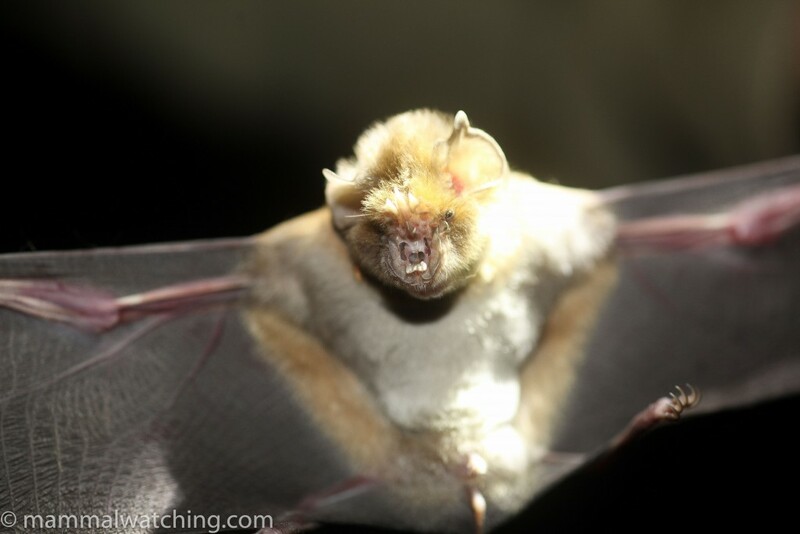 I think this was a Rufous Trident Nosed Bat, but it didn’t fully fit the description of any of the three species of trident bats in Nick Garbutt’s book (it weighed 13 grams with a 49mm forearm). We took a drive after dinner and didn’t see a great deal other than another Grey Mouse Lemur, Red-tailed Sportive Lemur and a Fat-tailed Dwarf Lemur. I went for a last solo walk for an hour at midnight. Great views of Giant Jumping Rats, a better view of a Grey Mouse Lemur and a quick look at my first Greater Hedgehog Tenrec. The 4oth mammal of the trip. Leaving at 5am the next morning we flushed a Bushpig along the road. There are some nice smaller mammals in the park, including Large-eared Tenrec, several Shrew-tenrec species and Lesser Hedgehog Tenrecs. All are best found with pitfall traps though the latter would be findable by quietly walking at night. Fossas, which I thought were guaranteed, aren’t. The dry season is very good for them. The wet can be hit or miss. I missed. And I’ve no idea where the Coquerel’s Giant Dwarf Lemurs got to. 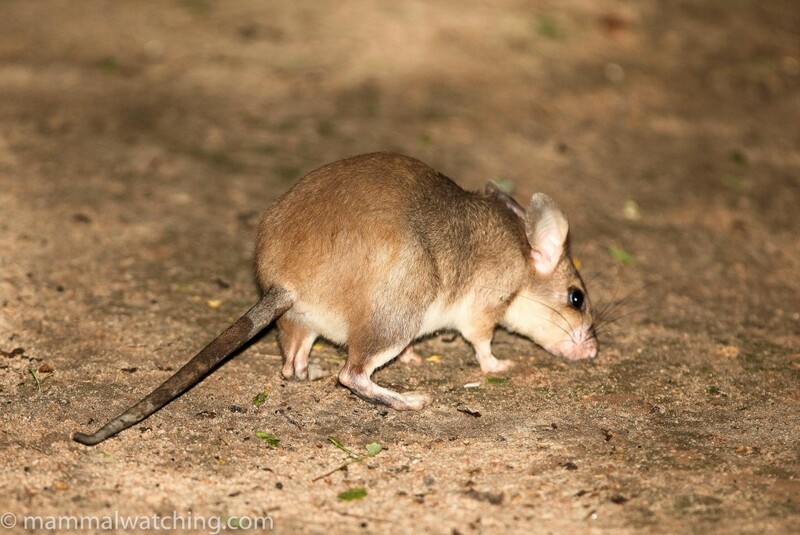 Western Tuft-tailed and Big-footed Mice are also reputedly common. 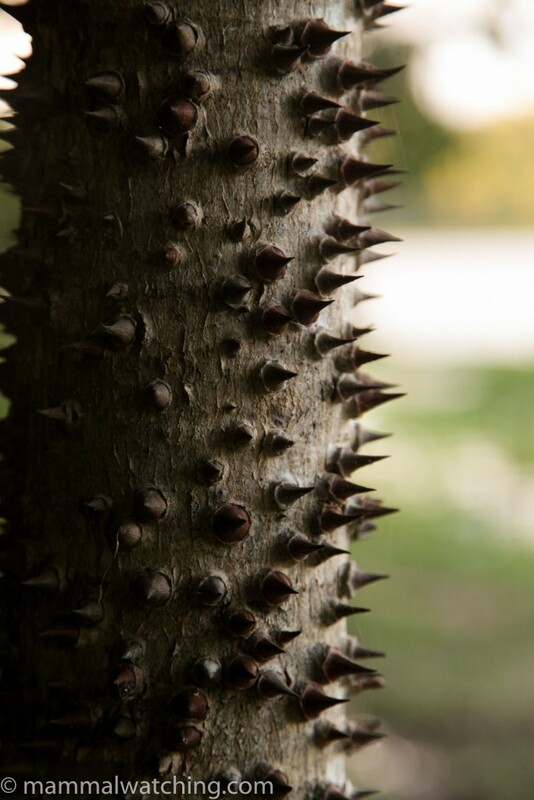 The researchers gave us some traps to try for them in trees. But, sadly, after some confusion they were not set. 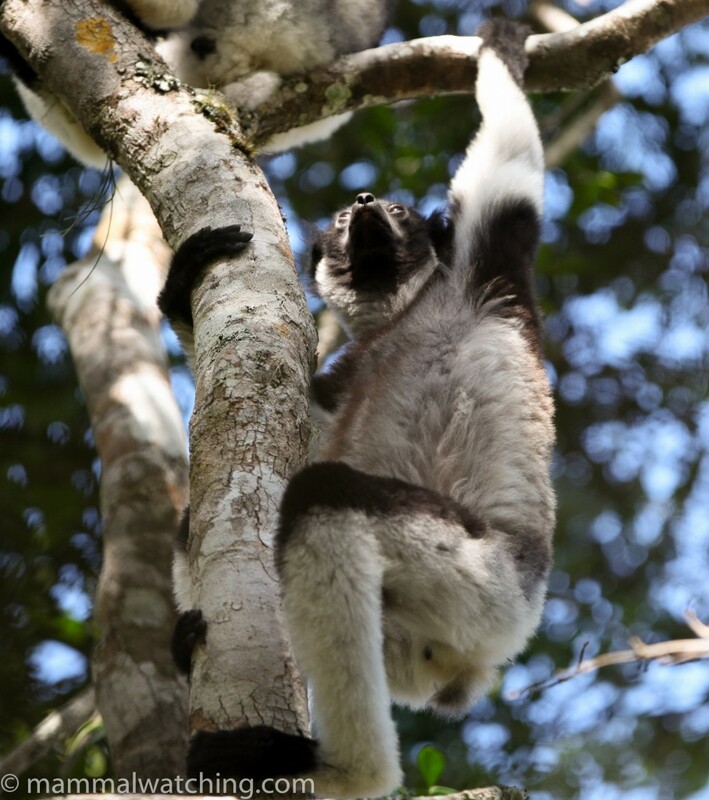 Fano was as frustrated as me at our missing Milne -Edward’s Sifakas so he hatched a plan. He reckoned with an insane amount of driving and a 10 hour detour it might just be possible to spend a couple of hours looking for Milne-Edward’s Sifakas again and still make my flight. I wasn’t going to object. What else was I going to do? Relax and sight see? Come on! It was a long day’s drive from Kirindy to as close to Ranomafana as possible. When we got to Ambositra at 6 p.m. it was raining. And it had been raining all afternoon in Ramofana. But a small army of guides (well four) had been dispatched into the park that afternoon to look for the missing Sifakas. And they had found a pair. The first that had been seen since I left. So the guides were staying with them until dusk and would return at dawn to keep tabs on them until we arrived. I spent the night in the friendly hotel Violette. 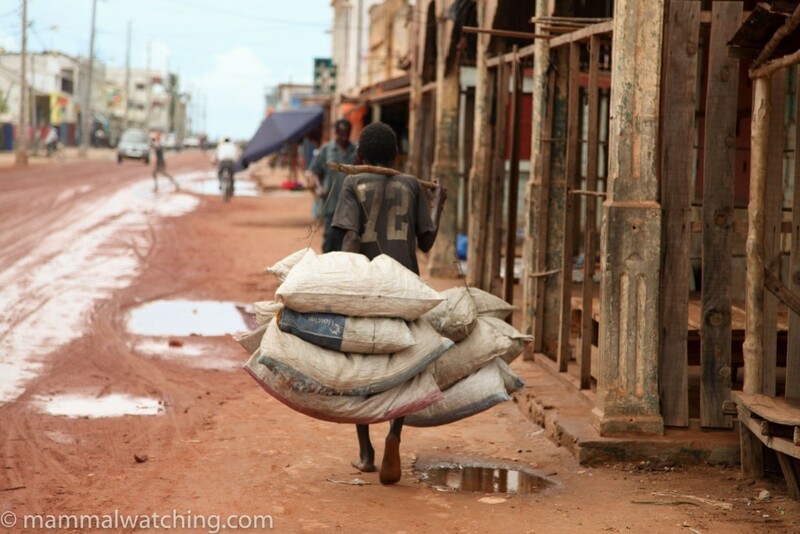 We left at Ambositra before 5 a.m., arriving at Ramofana on a beautiful day 3 hours later. Twenty minutes after that I was up at Belle Vue looking at a pair of Milne-Edward’s Sifakas – much to my and Fano’s delight and also the delight of at least 5 guides who had helped find the buggers. Lovely animals. They have a large territory, and they are fairly discrete so do not underestimate the time to find them. A quick look for Ringtailed Mongooses around Belle Vue (I was told they are seen a few times each month but October seems the easiest moment to spot them when they are daily up there) and we headed back down the hill again with a weather eye open for Lowland Red Forest Rats. We didn’t see either species. And then it was the long drive back to Tana. 42 species, 39 of them lifers.